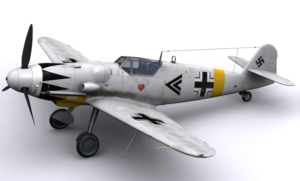 The Messerschmitt Bf 109 is a German World War II fighter aircraft that was the backbone of the Luftwaffe’s fighter force. 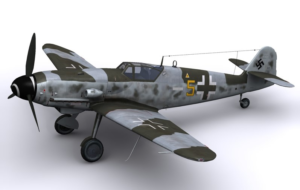 The Bf 109 first saw operational service in 1937 during the Spanish Civil War and was still in service at the dawn of the jet age at the end of World War II in 1945. 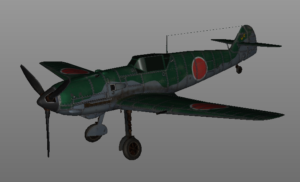 It was one of the most advanced fighters of the era, including such features as all-metal monocoque construction, a closed canopy, and retractable landing gear. It was powered by a liquid-cooled, inverted-V12 aero engine. 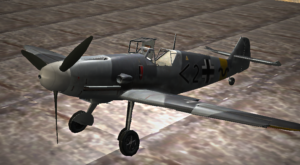 From the end of 1941, the Bf 109 was steadily being supplemented by the Focke-Wulf Fw 190. 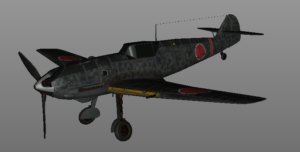 Jagdgeschwader 27 (JG 27) Afrika was sent in April 1941 to Gazala, North Africa in order to support the Afrikakorps. 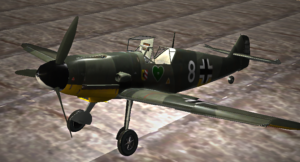 Fighting against the Desert Air Force’s generally inferior Hurricanes and P-40s, the Bf-109s inflicted heavy losses, claiming 588 aircraft shot down in the period of April 1941–November 1942. 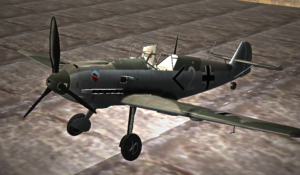 Galland’s Bf-109 E-4 circa december 1940 when he was serving with JG26 over the Channel. 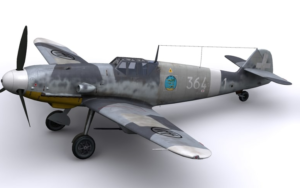 The Bf 109F, or ‘Friedrich’ saw a complete redesign of the wings, the cooling system and fuselage aerodynamics. 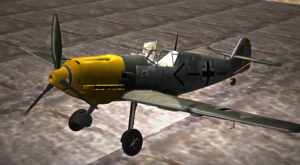 A handful of Bf 109Fs were used late in the Battle of Britain in 1940, but the variant only came into wide use in the 1941.Werner Molders became the first pilot in aviation history to claim 100 aerial victories and was highly decorated for his achievements. 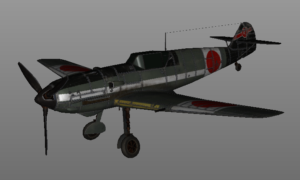 This is the plane he flew, when stationed in France during late 1940-early 1941, before being transferred to the Eastern Front. One of the most successful fighter pilots, Marseille was nicknamed the ‘Star of Africa’. 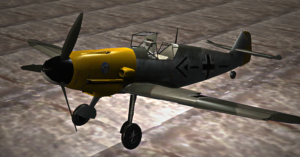 All but 7 of his 158 victories against the British Commonwealth’s Desert Air Force over North Africa, flying the Bf 109 fighter for his entire combat career. 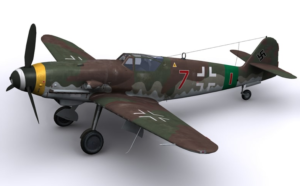 The model depicts the last Bf-109 F4 Trop assigned to Marseille. 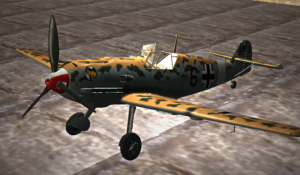 Walter Nowotny was an Austrian-born German fighter ace of World War II. He is credited with 258 aerial victories in 442 combat missions. 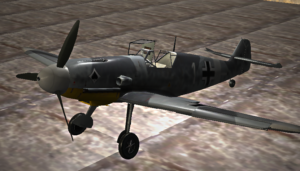 He flew the Bf-109 until the unit converted to the FW-190 in 1943. Gunther Rall was the third most successful fighter ace in history. He achieved a total of 275 victories during World War II. 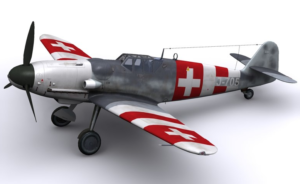 The model represents one of the planes he flew in early 1943 on the Eastern Front. 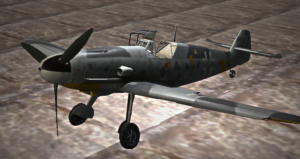 Bf-109s were delivered to Italy with the standard camouflage pattern and markings were usually oversprayed in the field. Squadriglia 364 ‘Gigi tre osei’ operated in Sicily against allied bombers until summer 1943. 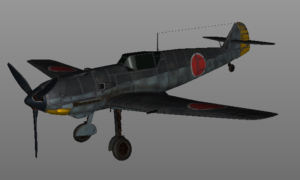 From the middle of 1944 new daytime camouflage schemes were introduced; this change is explained by the change of position of the Luftwaffe, which until then had been on the offensive and now had to defend itself, blending better into the ground. Erich Alfred Hartmann, nicknamed ‘Bubi’ by his comrades and ‘The Black Devil’ by his Soviet adversaries, was a German fighter pilot during World War II and with 352 victories is the highest-scoring fighter ace in the history of aerial warfare. 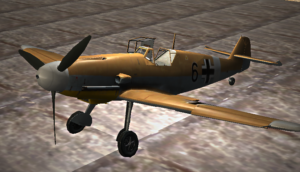 After 1944 Luftwaffe switched tactics, from offensive to defensive and Bf-109s were diverted to engage fighter escorts. The Defence of the Reich Gruppen sported a bright colored band on the fuselage and the nose.